Martin Eisenhardt (1877 – ?) was born in Berlin and lived from 1919 in Frankfurt (Oder). He was a businessman here. His wife, Dina Eisenhardt, née Baumblatt (1879 – 1942), originally came from Schweinfurt. Both had Jewish identity cards. They were last registered at Rosenstraße 36. This is where the Jewish hospital was. In 1942, they were deported with 761 other people to Theresienstadt. 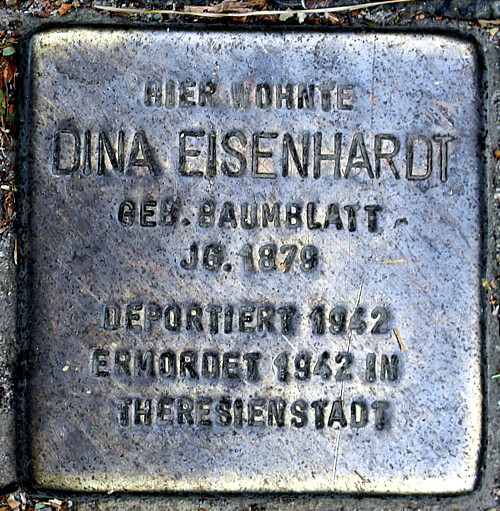 Dina Eisenhardt died there on 26 September 1942. 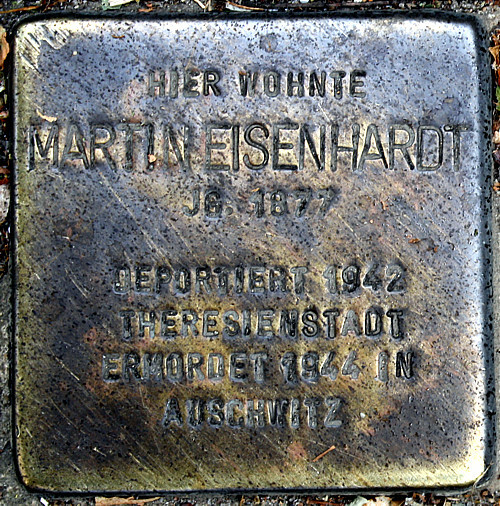 In May 1944, Martin Eisenhardt was deported to Auschwitz together with 2500 other people. Since then, Martin Eisenhardt has been considered missing.